I recall reading the words of Laurie Colwin that have resonated with me and in turn influenced this post. She wrote, ‘No one who cooks, cooks alone. Even at her most solitary, a cook in the kitchen is surrounded by generations of cooks past, the advice and menus of cooks present, the wisdom of cookbook writers'. I have been recipe testing these taralli in the last month from a hand written list of ingredients with vague quantities and an incomplete list of instructions to follow; a recipe belonging to my late mother in law, not written by her but by a friend whilst learning to make them. Those who have been reading my blog know that documenting and preserving our family recipes has been my aim from the onset of this blog. I hope that these recipes will also inspire the next generation to create their own versions of dishes, and to add their own flavour and style. It is therefore a cook who has now past - my mother in law whose recipe I have chosen to draw from and the advice and assistance of a cook present - my mother, in the preparation of these taralli all'uovo for the coming Easter. Hand written and titled by the person who transcribed the recipe, Taralli Bolliti di Giovanna, and in my mother in laws Sicilian dialect known as biscotti scaurati (boiled biscuits) are characterized by the fact that they are boiled before baked, barely sweet and delicately flavoured. On many occasions we enjoyed these biscuits made by Giovanna for our family celebrations and at Easter time; I therefore never needed to make them myself. With Giovanna’s passing, many of her recipes left with her, never documented nor cooked by me with her guidance. So this hand written recipe resurfaced and found its way back in my kitchen via her friend. Over a coffee we got talking about what an excellent cook she was and these biscuits - whose technical name is taralli due to their shape, shiny appearance and crisp cracker texture. Like many cooks of this generation, they cooked from experience and intuition and seldom wrote full detailed instructions. This recipe was noted whilst observing and in certain sections there were gaps that needed to be filled in - such as how long the dough needed to be worked, boiling and baking duration, to name a few. This is where research and advice of cooks present has assisted me in filling those disparities along with a few too many trials and errors. Admittedly, I have lost count of how many eggs I have used to recipe test these taralli. I needed to persevere and save this recipes integrity; after all I do consider it an heirloom. With advice from my sister in law and my husband, and an extra pair of hands and guidance from mamma we were able to fill the gaps. Of course with my husbands approval which came through taste testing, I can confidently say we now have Giovanna's recipe trialled and tested, and finally documented. Taralli such as the ones mamma makes - taralli con finocchio are very typical of the southern Italian regions of Campania, Puglia and Calabria, traditionally using simple ingredients - flour, water, oil, salt, and fennel seeds. Taralli all’uovo such as this recipe are typical of Puglia, so I’m not too sure how this recipe appeared amongst Giovanna’s array of Sicilian biscotti, however I have been told that they've been in the family for a very long time. The Sicilian version of these taralli, which Giovanna also made have the addition of milk and glazed with lemon scented icing sugar, known as taralli al limone (lemon taralli). Wherever these taralli originated from, she definitely put her own unique stamp on them in her use of spices such as cinnamon and aniseed combined, as well as how she shaped them. Her recipe mentions the use of lard which she liked to include in her baking, but there is an indication of the possible use of olive oil as a substitute. The traditional shape is a ring and after boiling them they are scored along the outer circumference so that they open when baked. My mother in law would form some as rings and others she would cut into with a knife to create daisies, dog and dove shapes. The dog and dove shapes have yet to be mastered by me, but I have created another dove shape which I am certain she would have liked. The recipe also uses a great deal of eggs leading me to question how taralli came about incorporating so many eggs. Easter and its traditional foods are filled with references to rebirth of all kinds, commemorating Christ's resurrection from the dead but also continuing the European springtime festivals from pre-Christian times that celebrated new growth after the dormancy of winter; the egg is one such symbol of new life. Why so many eggs you ask? In the early Christian calendar eggs were forbidden and restricted during the austerity of Lent as were meat and other products derived from an animal. This made them bountiful and exciting forty days later. Those who were lucky to have their own chickens were left with a large quantity of eggs laid and not consumed. So in the lead up to Easter baking and moving out of this period of abstinence, eggs were used in cooking both sweet and savoury dishes. Each Italian region has an Easter dish, a specialty pie, a sweet bread and biscuits enriched with eggs. You can use a stand mixer, or a hand mixer with both whisk and dough hook attachment. Alternatively a whisk to beat the eggs and good old fashioned elbow grease when it comes to kneading the dough. It is recommended that the final kneading is done through the pasta machine to ensure a well worked and smooth dough. In a large bowl, sift together both flours, cinnamon, aniseed and set aside. In a large mixing bowl add eggs and sugar and whisk until thick and creamy. Add oil and brandy and continue to whisk together. On low speed, add 1/3 of the flour mixture and combine well. It is now time to switch to the dough hook or alternatively begin mixing by hand and incorporate the remainder of the flour. Knead the dough for 15 minutes. Transfer the dough to a floured board, roll it into a log, cover with cling wrap and then a tea towel and allow it to rest for 30 minutes at room temperature. Cut dough into manageable pieces and press flat so that they fit through the pasta machine set at the widest setting. Pass each piece through 10 times to achieve well worked and smooth dough. Alternatively knead each piece by hand until you achieve a smooth dough. Roll out small pieces of dough to the thickness of a finger and turn into a donut shape ensuring ends are pressed together. You can make them large or small in diameter. I used the length of my knife as a guide so that all were cut to the same length. Flower shapes can then be created by cutting through half way as you move around the outer circle. The doves are knotted and one end cut into to resemble the doves tail. Once all taralli are formed, place on a tray and allow them to rest for 3 - 4 hours covered with a tea towel. During this time, the taralli will increase in size. Once the 3 - 4 hours are up, bring a large pot of water to a hot temperature, but not boiling nor simmering. When you begin to see a few bubbles forming, place 5 - 7 taralli in the water, ensuring there is no overcrowding. Once the taralli rise to the surface remove them with a slotted spoon and place them on a rack to drain and cool down. Repeat the process until all boiled. The overall texture of the taralli should be smooth with a sheen. Using a knife, score the exterior of the taralli and place on a lined baking tray. Bake in a preheated oven at 180 C (375 F) for 10 minutes, and then reduce to 160 C (325 F) for another 20-25 minutes until cracked and light golden in colour. In my first attempt at making these taralli, I didn't use the pasta machine to work the dough and the taralli cracked during the boiling process. I recommend that the dough be kneaded for a longer period of time or use the pasta machine to help with this process. My mother in law would allow them to rest overnight before boiling them. I trialed both methods and found there was no difference with the overall outcome, so I have suggested 3 - 4 hours in this final recipe, but left to the discretion of the reader. Ensure that you don't overcook the taralli when boiling them, as they turn out chewy and dense, not crispy and light as they should be once baked. Adjusting the oven temperature after 10 minutes ensures that the taralli have enough time to rise and open where scored and achieve a light golden colour allowing them to dry out evenly at the lower temperature. 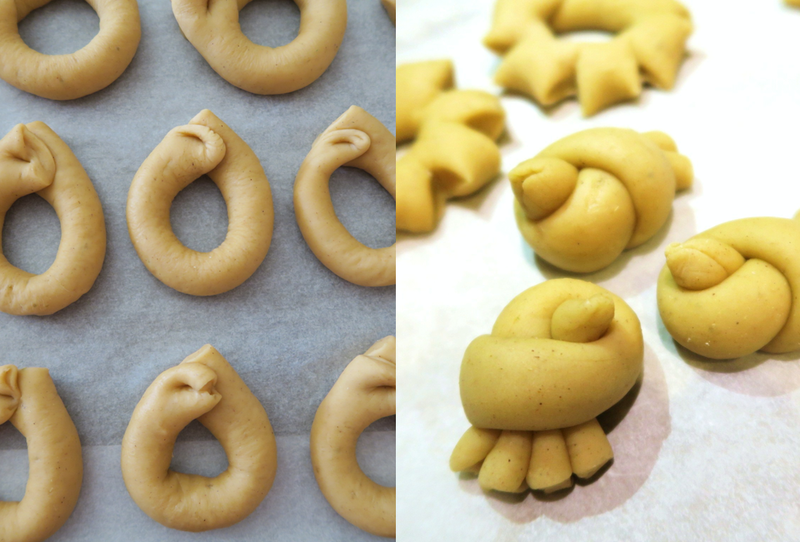 I hope you enjoy making these taralli as much as I did and are inspired to create your own shapes. Wishing you all a peaceful Easter. These look beautiful Carmen! I love how they have a story behind them and I admire your perseverance in getting the recipe just right -- bravissima! Buona Pasqua xoxo! Grazie Francesca. 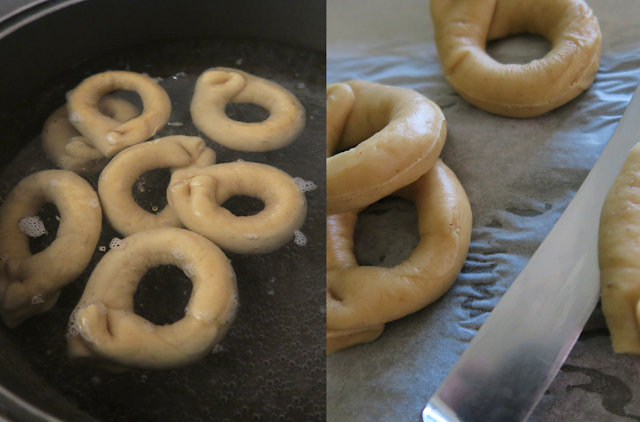 Taralli are not as forgiving s I thought, and a mere discrepancy can change the whole texture of it. The very first time I made them, they turned out chewy as I slightly overcooked them when boiling. Buona Pasqua anche a te cara! What can I say Carmen? These are just beautiful. Funnily enough, I recently discovered Laurie Colwin myself and she's absolutely right when she writes a cook never cooks alone, even if they are physically. Complimenti for all the work you've done to bring Giovanna's recipe to life for everyone else. Thank you Rosemary. I only knew my mother in law for a short period of time before she passed away, 7 years to be exact. I'm certain I would have enjoyed cooking and learning from her.